Enjoy our fine selection of baskets. We show here a selection of some of our favorites; additional styles can be seen in the studio, in our retail outlets, and at craft shows. Custom work can be easily arranged. Let our styles inspire you: we have baskets for fruits and vegetables, pies, herbs, flowers, cherries, wool, knitting, storage, picnics, or eggs. 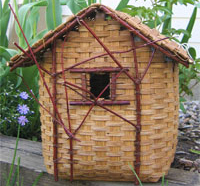 We have lovely large tulip-shaped baskets and birdhouses as well. To place an order, please call (802) 352-4734 between 7 AM and 8 PM Eastern Time. Wholesale accounts are encouraged. Please note: Dimensions do not include the heights of the handles. 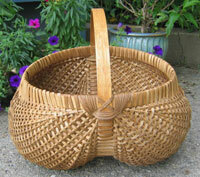 As all baskets are made by hand, the dimensions will very slightly.